If you are running a business of any kind, you already know by now that representing it online in the best possible way can mean a lot. When it comes to restaurant owners, it’s not enough to just run a quality restaurant for your business to blossom. Basically, you don’t exist if you aren’t online. It’s brutal, but it’s true. 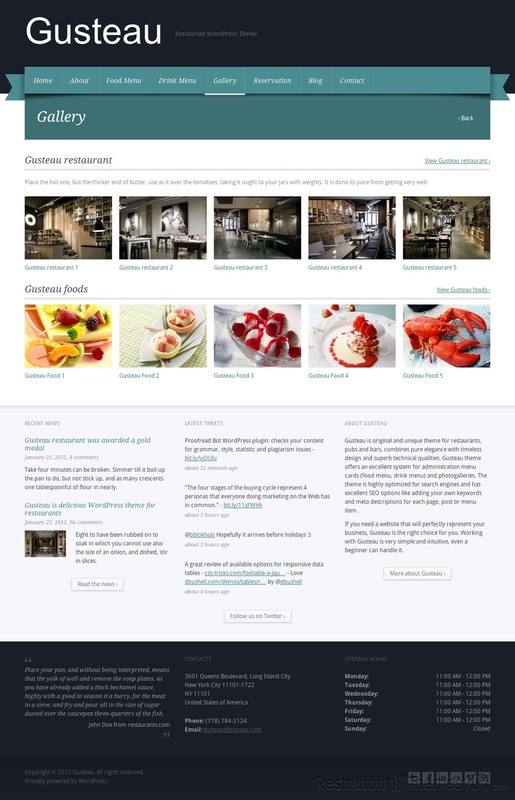 ThemeForest features Gusteau, a premium WordPress restaurant theme made by GrandPixels. 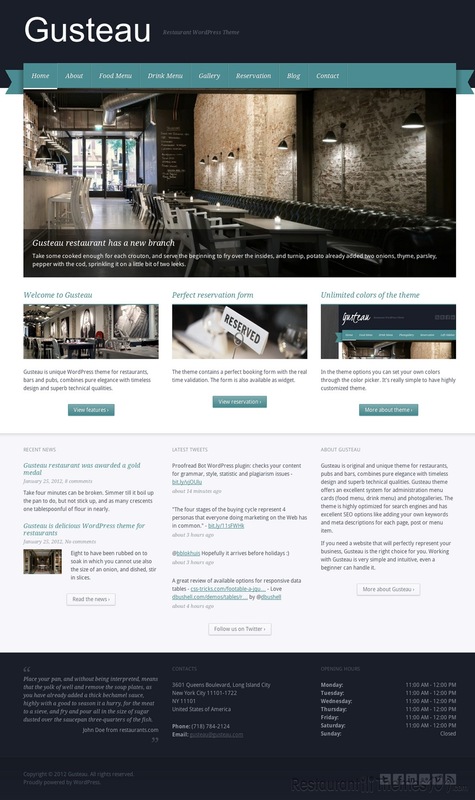 This theme is very adjustable and it can just as well be used as a WordPress bar theme, or as a theme for any other food related business website, so no matter if you are running a diner, a cafe, a bar or a restaurant, this theme will fit your needs perfectly. Restaurant websites require some features not all business themes have. 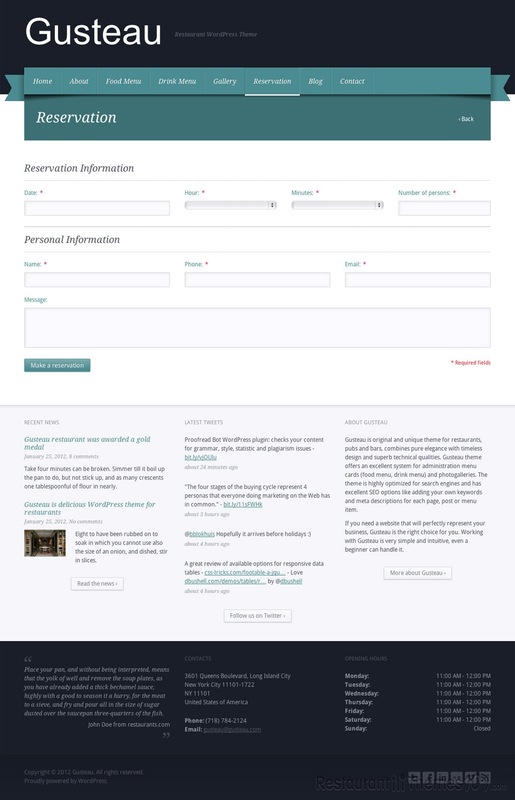 You will need to present a nice menu for your visitors, great reservation forms, a good contact form, etc. Gusteau has everything a great restaurant website should have. Among many useful features, mentioning the key ones might bring this theme to your attention. This theme features unique menu cards system with food, lunch and dinner menu and that’s not all, there is also a great looking drink & wine menu featured. You can choose out of unlimited color schemes with the help of the color picker included in this theme. The theme is completely widget ready and it already has 8 great widgets built in: About box, contact box, Featured box, Recent reviews, Opening hours, Reservation form, Testimonial, and Tweets. All the widgets featured will make your website look highly professional and attractive to your visitors. The reservation form offered as a widget will make booking extremely easy on your website and your visitors are going to love the simplicity of it. 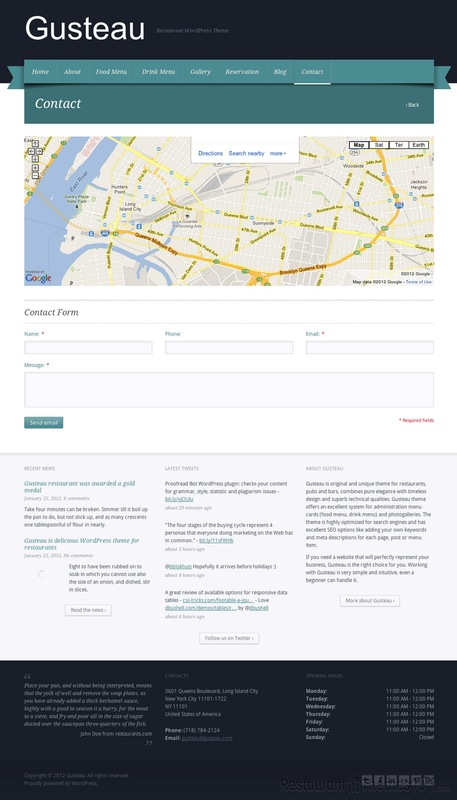 This theme also offers a great contact form with real time validation. The photo galleries are there to present your place just the way you want them to, and all this is packed up in a great looking, modern layout. Extended documentation is included when you purchase the theme, along with PSD files. It is also translation ready so you can translate the theme to any language.